For decades, a deep and wide chasm has existed between proponents of quantitative research methods and proponents of quantitative research methods. Market researchers have tended to adopt the biases of one or the other of these research camps. The influence of technology on market research and the widespread acceptance of social media as a research form, have eroded the traditional wall between quantitative and qualitative market research. While it is helpful to understand the unique strengths of both qualitative research methods and quantitative research methods, a true appreciation of a hybrid approach to market research is only possible by considering the benefits that come from combining both types of research. The goal of a hybrid approach to market research is to obtain the most actionable insights based on the deepest and richest data available. An associated benefit of hybrid market research is the cohesion that results from blending research techniques. Clients experience a cohesive research report when all of the data is presented in a single, integrated manner that comes across as having one authoritative voice. The value provided to clients by a hybrid approach is more clarity and greater depth of understanding since the quantitative data is "explained" by the qualitative data. The qualitative methods use a practical, familiar lens to interpret the sometimes obscure quantitative data in plain language to grateful clients. Quant Plus Qual - The first approach to a hybrid market research study that comes to mind is a quantitative inquiry that is followed by a study that is qualitative in nature. This approach permits a thorough review of the numerical data provided by the quantitative methods and a deeper look at the perspectives, motivations, and sentiment revealed through qualitative techniques. The rational, logical structure of the quantitative data is enriched through association with the emotional, subjective accounts obtained through qualitative methods. Qual Then Quant Then More Qual - A second typical approach to hybrid market research is seen when an investigation begins with a qualitative study and is then followed by a comprehensive quantitative study to validate the insights that were revealed through qualitative methods. Once this step is complete, the investigators employ qualitative methods again to further illuminate the quantitative and first-round qualitative results. This deeper qualitative exploration can serve as an overarching organizer for all of the accumulated findings and provide the rigor that enables the market researchers to speak confidently of their conclusions and recommendations for action. Paired Qual and Quant - When study participants are asked to provide responses that are both qualitative and quantitative in nature, they engage in a paired methods hybrid approach. Market researchers can conduct this type of hybrid study with a focus group in which the participants respond via technology. Market researchers typically employ this approach when time is short. This is the sort of market research that can be referred to as "fast and friendly" because it tilts toward quick action and less actual depth. In the minds of the clients, the quantitative component of a paired methods hybrid market research study lends a measure of credibility and reliability that would be missing in a purely qualitative inquiry. Market researchers have multiple objectives when they engage in a study. Naturally, when investigators conduct a study, they are interested in obtaining the most robust results possible. But there are other objectives that gain their attention as well. The response of clients to the research study they are sponsoring or purchasing is an important factor that can't be ignored by the researchers, It is apparent that when market researchers make a strong effort to ensure that their studies are conducted with rigor and integrity, they will reap the trust of their clients. Reputation is important in the small world of creative advertising agencies and market research providers. 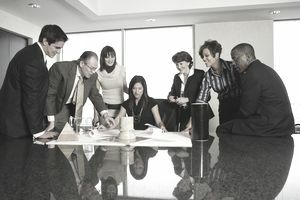 Any investment that market researchers make in the quality of their techniques, whether qualitative or quantitative, signals their capacity and trustworthiness. Just Show Me the Numbers!